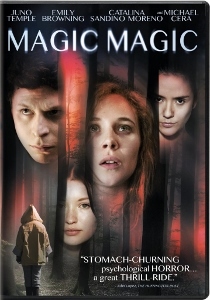 Despite a terrible title that conveys nothing of its content, Magic Magic is a compelling little psychological thriller. Written and directed by Sebastián Silva, this Chilean production is admittedly a bit of a shaggy dog story but it’s well paced and especially well acted. Just don’t let anyone tell you it’s a horror movie. Not so much scary as it is disturbing, the plot centers on Alicia (Juno Temple), an American who feels trapped in rural Chile. She’s visiting her cousin, Sarah (Emily Browning), who’s staying with friends while attending school. That’s Sarah’s official story, anyway. Alicia’s trip begins badly as Sarah needs to go away for reasons that remain unclear. Stuck with Sarah’s friends, Barbara (Catalina Sandino Moreno), Brink (Michael Cera), and Agustin (Agustin Silva), Alicia becomes increasingly anxiety ridden and sleep deprived. Over the course of a few days, Alicia worries that all three of these friends are out to get her, especially Barbara. By the time Sarah returns, Alicia’s behavior is scarily erratic. She and Brink are particularly at odds. At one point she sexually assaults him in the middle of the night and has no recollection of it the next day. Agustin, Sarah’s boyfriend, is something of an amateur hypnotist. He tries to put Alicia under his influence at one point, with horrible results. Barbara’s growing concern for Alicia’s mental deterioration amounts to little more than the dispensing of sleeping pills. The others quite reasonably suggest the need for a hospital visit, but Barbara protests. The nearest hospital is some five hours away, after all. There’s not much plot-wise to Magic Magic, but luckily there is atmosphere to spare. Director Silva perfectly achieves the unsettling feeling of being truly out of place and far from one’s comfort zone. He gets spot-on performances from his primary cast, with Cera a revelation in particular. His portrayal is effectively ambiguous, keeping the audience guessing as to whether we’re seeing the “real” Brink or merely Alicia’s perception of him. And Temple is typically fearless, mining similar territory here as in 2012’s Jack & Diane. Fans of Roman Polanski’s Repulsion and similarly depictions of a descent into madness are likely to find much to enjoy in Magic Magic. It doesn’t deliver any great payoff, but as a work of disorienting discomfort laced with subtle touches of humor, it’s an actor’s showcase well worth seeking out.